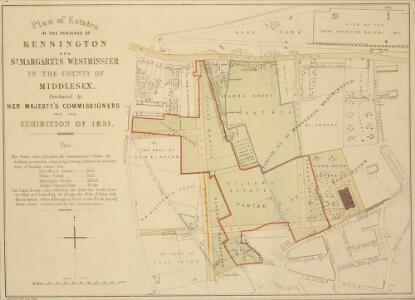 Description: The site in South Kensington depicted in green on this plan was purchased by the Queen's Commissioners to host the Great Exhibition of 1851. The title, key to colours, compass star and scale bar appear down the left side of the plate. The boundaries of the four properties comprising the commissioners' estate are outlined as follows: Gore House in blue, Villar in red, Harrington in yellow and the Smith's Charity Estate in brown.